I had the opportunity recently to speak with Sharon Eiden Cornejo of Asset Management Services, whose subsidiary GovMint.com is the exclusive worldwide distributor of the first silver bullion strike Angel. Among other questions, I asked about the latest addition to the Angel range and discussed the background of both the legacy and modern Angel coins and why this coin retains such popularity with so many collectors of all interests. With such a fiercely competitive bullion market, the angel has comfortably held its own over the last thirty years and if what we’ve seen over these last three decades has anything to determine with what’s in store for this sought after coin, the Angels will be around for many years to come, and then some – read on & enjoy! MA: Hello Sharon, Thank you for speaking with me today. Your department at Asset Marketing Services have been in the process of promoting a new product, the first silver bullion strike angel – which was minted to celebrate the ever-popular Isle of Man gold Angel’s 30th anniversary, this coin is the first time a silver bullion quality angel crown has been produced – the other silver coins being proof & minted in 1995 and 2010, how are the sales for this beautiful coin progressing so far..? MA: I have the new 2014 silver angel in front of me now and it’s a beautiful crown, I’ve been receiving questions about both the gold and now the silver ounce coin, asking why I hadn’t covered the issue of the new silver coin until now, why haven’t we heard about the coin until just recently..? SEC: We did a “soft” release back in the fall of 2013. Response was quick and strong, proving that this is a coin that collectors want to add to their collections. Throughout 2014 we have continued with our promotions and sales have been strong while interest continues to grow. A quick background on the Angel series. The first modern Angels were released by Pobjoy Mint in 1984. These were proof fractional gold coins struck in 1 oz, ½ oz, ¼ oz, 1/10 oz and 1/20th oz sizes. The design was so well received that the following year it was awarded the prestigious Coin of the Year award for Best Gold Coin. It was only fitting that in celebration of the 30th Anniversary of the Angel series, a first year issue silver bullion Angel be added. 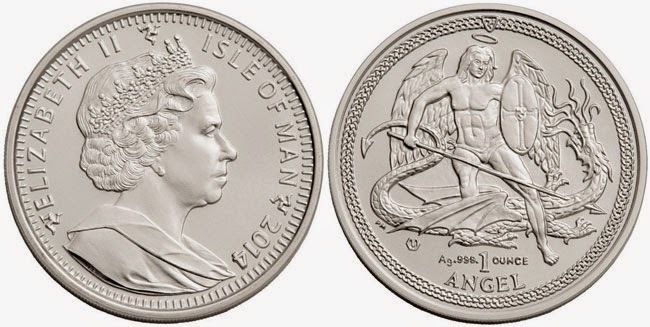 MA: The original angel coin itself has a very long history – stretching all the way back to the reign of King Henry VIII, much earlier than the modern Isle of Man issued coins which have managed to make this coin so popular with bullion investors and coin collectors alike (who favor the proof editions), what is either your favorite “folklore” legend about the legacy coin or aspect of the modern edition..? SEC: I like the traditional story of medieval Kings and Queens giving the Angel coins to their workers that they deemed worthy of receiving one. These workers in turn believed that the Angel coin brought them good luck and fortune and sometimes even thought to cure sickness and save lives. That is a lot of power for one coin to hold! These are also great generational coins that are passed down from one generation to the next. Often given as tokens of good luck. We even have employees that carry them around in their pockets as a good luck piece. The Silver Angel for many years has been one of the missing pieces in the coin collector world. In years to come, this coin could become as sought after as an American Silver Eagle or China Silver Panda. MA: I especially love the silver examples myself and yes, the first year issue has indeed become one of the “key” coins to have added early on. What was so exciting about the gold issues from the start was the very large size & variety from 15 ounce at one time right down to 1/20th ounce, are there any plans to produce the same variations in sizes for the silver coins..? SEC: In 2013, Pobjoy Mint issued a 5 ounce silver proof in spectacular high relief which was carried exclusively by Govmint.com. It is quite an impressive coin showing all the details of the battle between St. Michael & the Dragon. But at this time we do not have plans to produce a full range of sizes in silver, however we do have some very exciting coins in a variety of sizes and metals coming up for 2015, including another 1oz Silver bullion. MA: Over the past 30 years of production, there have been some real changes for the coin, most noteworthy, the quality of the strikes and the high relief examples, in your opinion, what has been the greatest change in the range and which example or version is the best-selling in the gold range of coins..? SEC: The Angel series has come a long way since 1984. Of course the award winning 1984 design is a favorite for me and for our customers. Pobjoy Mint has produced some amazing coins over the years. The skill that was used to create the Silver and Gold Bimetal coin in 2009 and again in 2011 when they produced a Platinum and Gold Bimetal Angel, knowing how difficult Platinum can be to strike much less put into a bimetal coin! And as I mentioned earlier, the careful precision to create the first ever 5 ounce High Relief Silver Proof Angel. As you can tell, it is hard to pick just one! The first year issue 1984 design still holds the title as our best selling gold Angel, however the 2006 1 ounce Angel struck in High Relief Gold Proof isn’t too far behind. MA: 30 years is a substantial time to have been part of a very active worldwide bullion market, so many changes have taken place and a great number of products have entered the market since 1985, what changes from the perception of Asset Marketing have been the most profound and how does the Angel “make its mark” in such a competitive market – what current trends do you see taking root for bullion related coins..? SEC: The Pobjoy Mint is known for its quality and attention to detail. The history and legacy of the modern Pobjoy Angel series and vintage versions of the Angel coin makes this a great collector piece. Not many of the modern silver bullion pieces have such a history to their design like the Angel’s history – dating back over 500 years. The Silver Angel bullion has already started strong in its first year and I only see it getting stronger and gaining more collectors in the coming years. MA: This coin has always been a real favorite of mine since its introduction and I look forward to following any changes it may have the future – including a possible new portrait of the Queen shortly. Sharon Eiden Cornejo, Vice President of Product Development of GovMint.com, thank you so much for your time today.